If you know your pasta, you know that the image and the title here don’t match; that’s because, for some reason, they weren’t selling orecchiette the day I went to Gelson’s. I almost threw in the towel but then I thought, “Why don’t I find another pasta shape that’s kind of like orecchiette?” Which is how I wound up with the shells you see in the above photo. And the shells worked really nicely in this pretty phenomenal, though decidedly unhealthy, pasta dinner from Nancy Silverton’s Mozza Cookbook. What’s so great about the Mozza cookbook is how detailed it is. 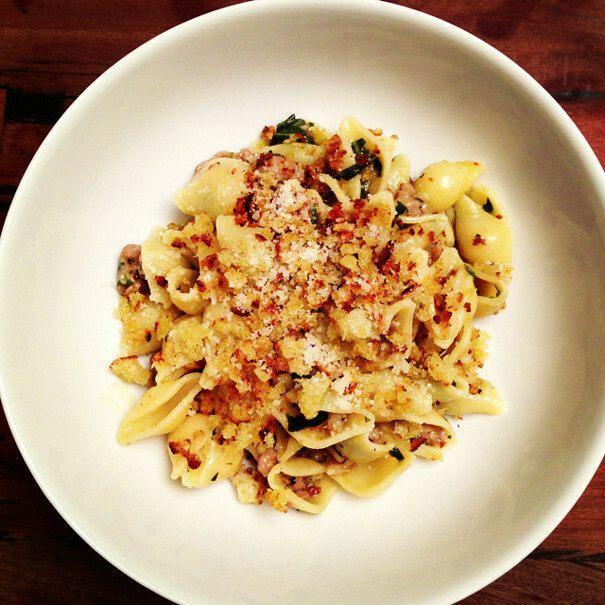 Nancy Silverton is an absolute perfectionist and if you followed this recipe to the letter, you’d be spending all day making orecchiette from scratch, as well as your own fennel sausage, your own chicken stock, and your own bread crumbs. Well, actually, I had time for the latter two. But certain aspects of this recipe don’t make any sense for the home cook; in particular, you make a big batch of cooked Swiss chard and then only use 1/4 cup of it? This home cook needed to make some revisions. 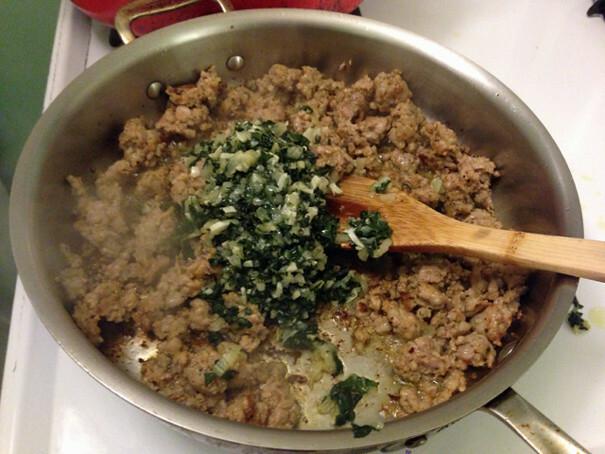 For starters, I made the Swiss chard mixture just as the recipe says–with lots of garlic, onion, and chiles–but instead of setting most of it aside, I used almost all of it in the finished recipe. Sure, it throws off the balance, but I didn’t want to waste it. As for the sausage, I used what I found at Gelson’s and it worked great. You really don’t need to make your own chicken stock for this; the idea is that it just helps marry all the flavors. One step that’s very restauranty but makes a big difference at home is butter. You add butter to the mix and it makes everything way more sultry and special-tasting. It adds that “why does this taste so good?” quality that’ll set this pasta apart. At the end, you add your cooked pasta which is still quite al dente (it finishes in the sauce) and lots of cheese. To gild the lily, you top with toasted bread crumbs (if you follow Silverton’s advice, you should make brioche bread crumbs because of the butter content…which sounds great, but I opted for sourdough) and it gives the finished dish a nice crunch and extra layer of complexity. Summary: From the Mozza cookbook. Start with the chard. After washing carefully, pull the leaves from the ribs. Roughly chop the leaves and set aside. Cut off and discard the very ends of the ribs and slice the ribs 1/4 inch thick. Heat olive oil in a large saute pan over medium-high heat and add the ribs, season with salt, and saute for 2 to 3 minutes until just translucent (not at all brown). Add the onion, garlic, and chiles and season with salt. Saute the vegetables for 10 minutes, adding water to the pan (up to 1 cup), stirring often to prevent the vegetables from browning. 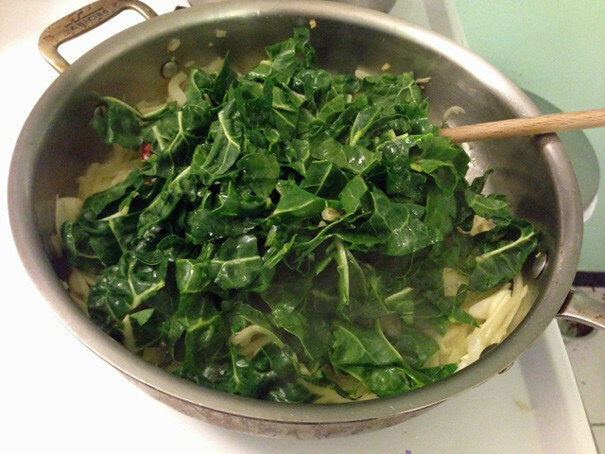 Add the chard leaves, season with salt, and fold the leaves in with the onion for 1 or 2 minutes to wilt slightly. Cover, reduce the heat to low, and cook for 15 to 20 minutes, stirring now and again, until the leaves are very dark green. Turn the vegetables out onto a cutting board and chop in all directions until you have a homogenous mixture (almost like a puree). Now heat a saute pan over high heat. Add the sausage with a splash of olive oil and cook until the meat starts to sear. Break it up with a spoon into pea-size pieces and cook until it’s browned on the outside and cooked on the inside. 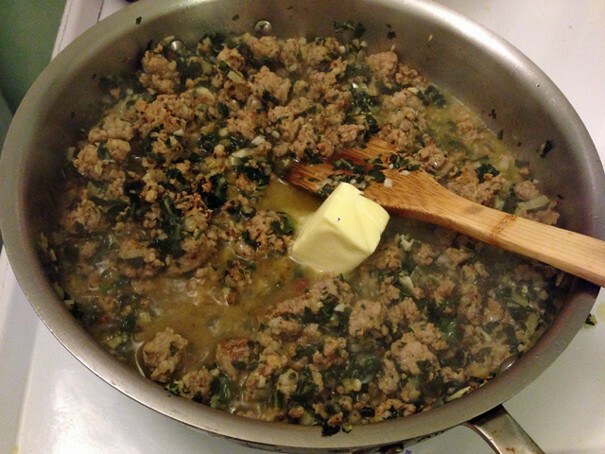 Add the chopped chard and cook for 2 to 3 minutes to warm it through. Sprinkle the pepper over the sausage, add the chicken stock, and cook the sauce for 2 minutes, stirring constantly, to bring the ingredients together. Add the butter, stir until it melts, and turn off the heat while you cook the pasta. Cook the pasta in a large pot of salted, rapidly boiling water. About 1 minute before the pasta is done, place the sauce back on high heat. Lift the pasta out of the water and add it to the pan with the sauce. Cook the pasta with the sauce together for 1 to 2 minutes, stirring with a rubber spatula, until the sauce is thick, adding fresh water to the pan if the pasta looks dry or sticky instead of slippery and glistening. Turn off the heat and stir in the finishing quality olive oil, the Parmesan, fennel pollen (if using). 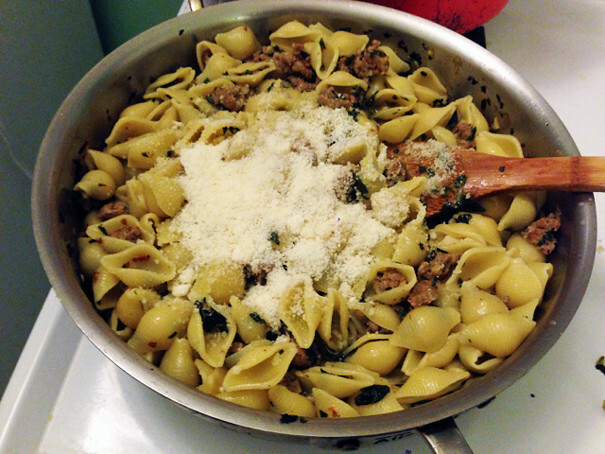 Spoon into warmed bowls and top with the breadcrumbs.